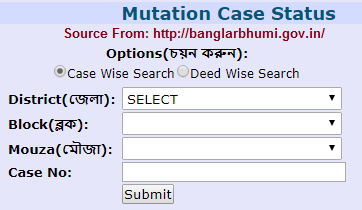 Know the Banglarbhumi Mutation case status, West Bengal Land Records Property Value, Banglarbhumi Khatian RS LR Plot information at banglarbhumi.gov.in portal…. Banglarbhumi is the official website of the Land and Land Reform Department, under the government of West Bengal. Hosted by National Informatics Centre (NIC), this site came to existence from 2010 onwards. West Bengal has a much diversified culture for its land. For a state having the maximum number of sharecroppers, it becomes very crucial to have a stabilized land reform department. The revamped website has given comprehensive interface to other departments under the state government. Banglarbhumi Land Records can be accessed through different devices i.e. desktop, tablet, PC’s and mobile phones with varying screen sizes. One of the salient features of the website is that it is interactive and suggestions or clarifications related to land reform within the state can be sought through the online feedback form. Of the many facilities and information which the website provides one such facility is to check the banglarbhumi mutation case status. Briefly describing the mutation status is the one which includes the transfer of ownership when the land is being purchased or transferred from one owner to a new owner. Then enter the case number and click on submit button. You will get your information. Enter deed number and deed year. You will get your desired information. You can also take a print of it. Step 1: click on the “DLRS” or “citizen services” heading. Step 2: then select “RS-LR plot information” section. Step 3: the mouza identification webpage will appear. Here you are required to enter district, block and mouza details. Step 5: Select the appropriate option and then enter the plot number and submit it. You will get the complete information. Banglarbhumi.gov.in atea kee akhon off a6a? When will this important site open. The banglarbhumi.gov.in site is not working properly. It could become a reason of falsification in property transaction meanwhile. It is a humble request to the department to relaunch the website as soon as possible. site is not open long tiime, so we can not know the important information about mutation case.